Mmmmm. My whole house smells like a chocolate coated deep fat fryer, but it has been worth it. I made salmon cat treats at the beginning of this week, as my beloved partner was across the country, 4000 odd kilometres away in La Belle Province (Quebec). He needed to be that far away for me to attempt this odd culinary feat, as the smell of salmon makes him nauseated. This is a huge challenge for someone who lives on the Pacific Northwest coast, as every summer is replete with fantastic salmon barbecues, and in the winter, salmon makes its appearance in puff pastry, in sushi, smoked on bagels, and relished in sandwiches. And he, good soul, puts a very brave face on it. But I knew this would send him ‘round the twist, so I have waited for the opportunity to make these feline fancies, when I knew he would be out of town. Before I get too far off on a tangent, let me reassure you: NO. Even though I made bacon chocolate last week, this week WILL NOT feature salmon and chocolate. This is preamble. Needless to say, my kitchen was indeed very salmon scented, once these kitty treats had finished baking. Full of delicious, natural, wild-caught, no additive ingredients … Ozzie and Serena turned their small triangular noses up and spat them out when I offered them what I thought would be a big hit. Epic Fail, as the boys would say. And, upon first sniff when the boys arrived home for lunch, the kitchen was deemed “gag worthy”. And I realize there will be no working with my beautiful, expensive chocolate until this odiferous situation is dealt with. I had planned to attempt palette-shaped bon bons this week, as I have never succeeded at enrobing them, but that is now on hold. As Pam says, in the Ecole Chocolat lesson plans, one smidgen of garlic on a silicon spatula is enough to taint a whole batch of bon bons. I sniff my sweater – it is fishy. I shudder to imagine how a batch of salmon-infused bon bons would go over. I have to do something. After taking the salmon cat treats across to our neighbor, who has two ravenous dogs and an equally ravenous cat (who has been known to steal bags of bread from our kitchen! The cat, not our neighbor – she’s lovely), I received a rapturous reception, and thankfully left the smelly treats at their house. Upon returning home, I turn on the self-cleaning cycle of the oven, and prepare for 3 and a half hours of chilly house. I have to leave the windows open and turn off the heat to avoid setting off the smoke detector, so when the boys arrive home from school, they keep their coats on, and I don my scarf and mitts, feeling very Bob Cratchit-like, as I scratch away with my pencil, working on a rehearsal schedule. We are all freezing. And I cannot put anything in the pristine oven. I have been having day dreams of hot climates and lazy summer days. And I know what we need. I pull down from the kitchen book shelf a well-worn, “I’ve been everywhere with you” tome: The Harrowsmith Cookbook, Volume Two. And I smile reminiscently, holding it in my hands. I picked this old friend up in the bargain section of a bookstore in Edmonton, while I was on tour with Green Thumb Theatre in 1984, and clearly longing for a home cooked meal. 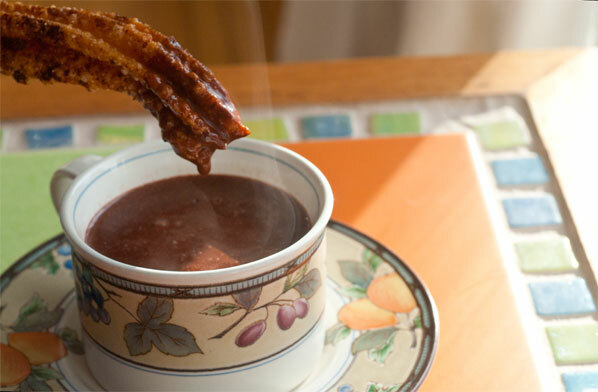 The picture shows a thick, pudding-like chocolate beverage, replete with a dollop of whipped cream, just perfect for having a Churro (a Spanish Doughnut) dipped in it. I have never made the recipe, in all the years I have had the book. Clearly, now is the time. Yep, that’s what we’re having. A completely over-the-top-spoil-your-appetite-for-dinner treat. 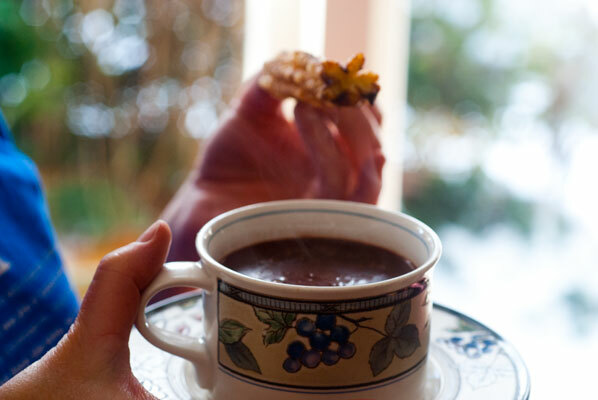 Castilian Hot Chocolate, and Churros. 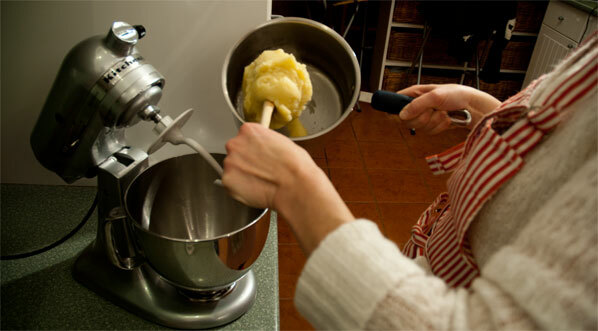 I find a recipe which appeals to me, chiefly because it uses butter as one of its central, very simple ingredients. The method reminds me of making a chou pastry for profiteroles: butter is brought to a boil with water, and the flour added all at once, and mixed vigorously. The addition of eggs makes the dough shiny, somewhat elastic, and very easy to work with. It rolls obligingly off the silicon spatula, as I dump it into a pastry bag, fitted with a large star tip. Reminds me a little of Play-doh, but much tastier! 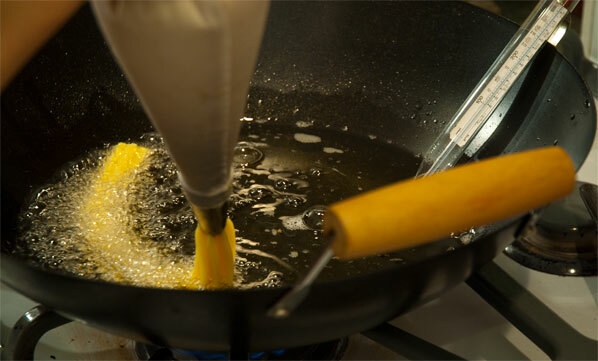 I use a wok as a deep-fryer, my candy thermometer submerged in the oil. 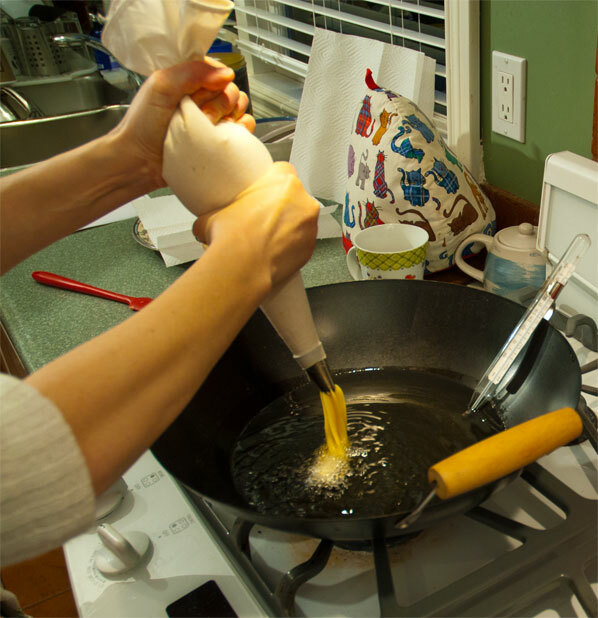 I would not attempt any deep-frying without a reliable candy thermometer. 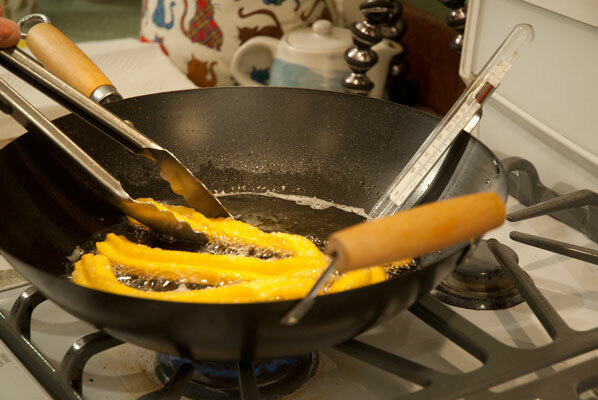 The wok comfortably fits five or six dough ribbons, which I squeeze from the pastry bag and cut off (rather clumsily) with a flick of the spatula. The first batch is a little light in colour, as is usual with anything deep-fried, but once the temperature of the oil settles to an even 360 degrees F, the next batches come out a deeper, almost caramel colour, after 6 minutes, flipped once. 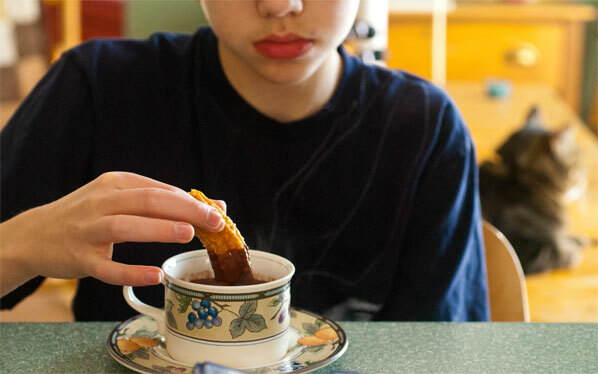 Once dusted with sugar and a soupcon of cinnamon, they are taste-tested. Light and much fluffier than a doughnut, the ridges on the outside create a nice crispness, while the inside is soft and delicate. They need a little more cinnamon, I think. 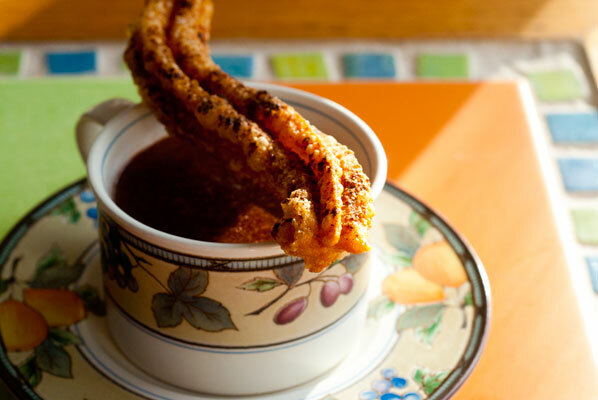 Once the churros are resting between paper towels, I turn my attention to the Hot Chocolate. Although this week has been a wash out for Chocolate Apprentice homework, I can at least feel good about making something akin to what the original consumers of xocolātl might have enjoyed. I definitely defer to Lorna Wollner (from Moberly Fire Lookout in Alberta) in the Harrowsmith recipe, for her method of mixing the ingredients in the blender. In a blender, combine cocoa, cornstarch, and ½ cup of the milk. 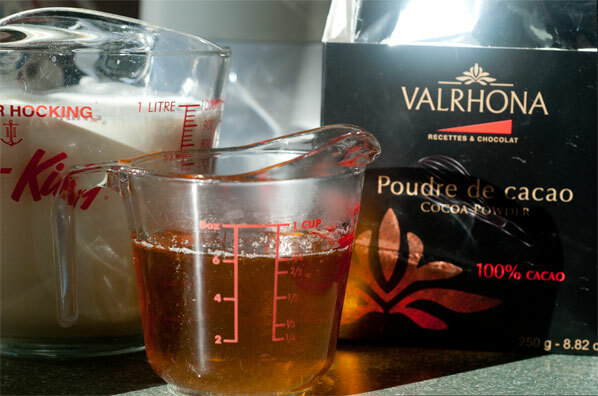 Mix to form a paste, gradually add the rest of the milk and cream, then the warmed honey. 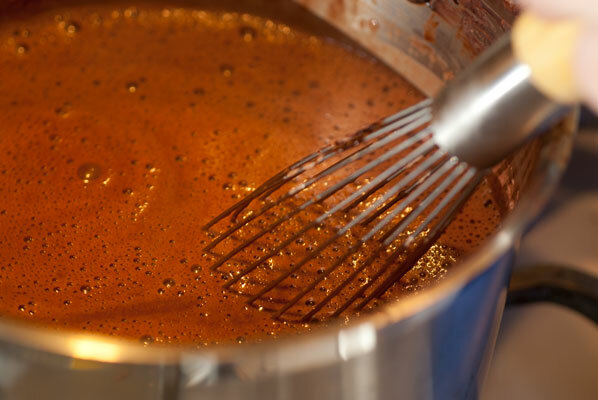 Transfer the mixture to a heavy-bottomed pan, and bring to a simmer, whisking constantly. 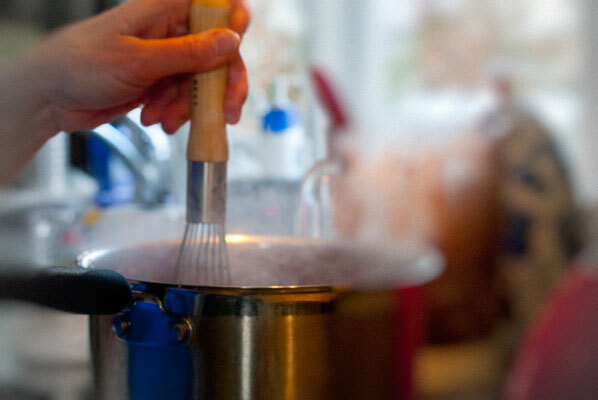 Cook for ten minutes at a simmer, whisking constantly, until the mixture is thick. 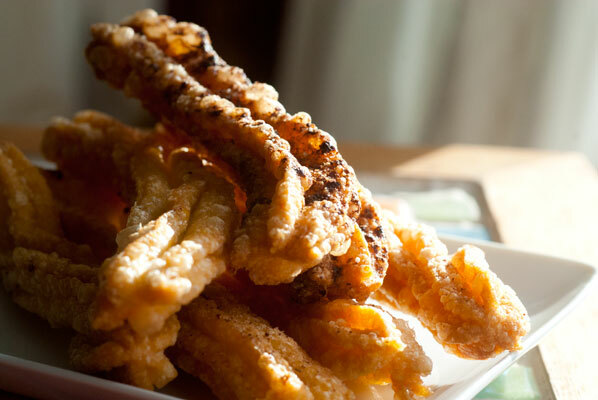 Pour into cups and serve with churros. 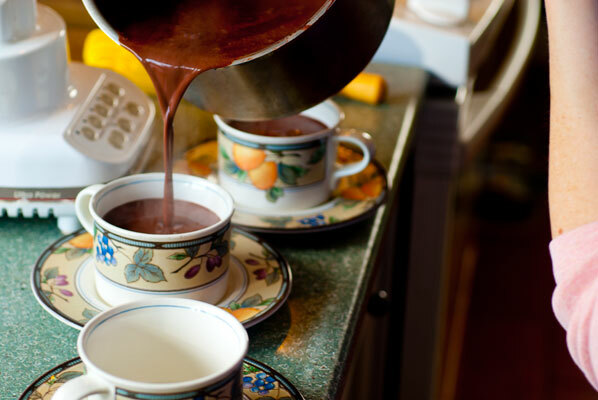 The resulting hot chocolate was so hot, we had to leave it for a full ten minutes before it could be drunk. Ours didn’t thicken to the point where it could be spooned, until after it had been refrigerated (when it turned into a delicious pudding), but I actually preferred it a little thinner, to enable dunking the churros in and actually consuming it as a beverage. The verdict: really tasty. I loved the combination of light pastry and rich hot chocolate – less rich than drinking chocolate, made with chocolate and cream, but therefore, a nice alternative to have with a pastry. I was expecting a slightly grainy texture, because of the cornstarch, but was pleasantly surprised as the smoothness. We ended up refrigerating the leftover chocolate mixture. 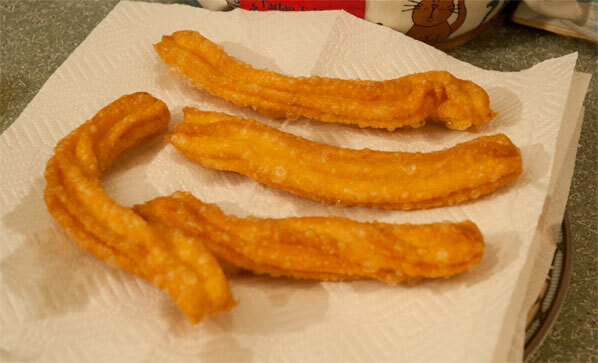 I actually found the churros much better the next day, re-heated for ten minutes in the oven, then drained again on paper towels. This removed even more of the oil, and let the crispiness come through. And so, the week which started out with a fishy smelling kitchen, ended up with one smelling like the food stalls at a county fair. And Hola! This is a vast improvement.